Our philosophy, “Less is More. Keep it simple ... ”, as stated on the page Web site development actually comes from our strong background in usability engineering. The goal of usabillity engineering is to provide users with easier to understand, easier to learn, even more fun to use tools for completing their tasks more efficiently. To achieve that you need to put the user — the human — in the center of attention, but usability engineering is not common sense. It is a bit more complex. “You do not want to guess about what is right. The user should be always right, because there are no silly users, only bad user interfaces. But users are not designers and designers are not users — “Do not rely solely on their suggestions for improvement.”. Therefore, we need an objective view based on empirical results from user interface evaluation and user testing. Usability engineering is a process that should be integrated well into the product management respectively software development process. 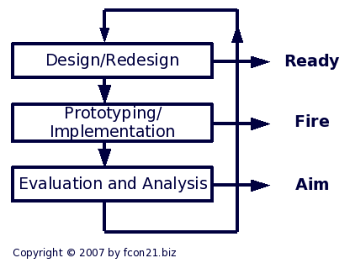 That way one can achieve the most cost effectiveness through iterative refinement procedures that accompany development. Each step is being briefly described below. 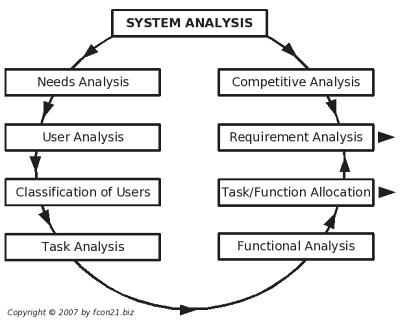 The system analysis provides fundamental data for the user interface design. It is almost like answering questions like, e.g. “Who are the users?”, “What's their background and experience?”, “What tasks will they have to perform?”, “What functions will be needed … ”, etc. Some parts of the analysis can be as simple as filling out a form others may require more thought. Others may be optional depending on the case. In any case the analysis focuses on the user in its native environment and the real world task. For example, if the user is constantly interupted by phone or colleagues all the time, the analysis shall consider that fact. In practice we use our set of prepared forms that guide quickly through system analysis and serve for documentation purposes as well. If you put such benchmarks in context to a “financial impact analysis”, you can easily see that better usability increases your return on investment. There is a whole lot more to write about system analysis, but at this point we shall proceed to the next step. Basically three different skill levels are required. At first a “domain expert”, who contributes the content for the Web site. Secondly the “user interaction developer”, who brings design and usability in. Last but not least the “user interface software developer” who writes the code. Depending on the size of the project this is accomplished by a large team or just a single person. If a single person does it all, it is important to keep the different roles distinct — “Work under different hats!”. Evaluation and user feedback should begin in early stages to discover possible problems right at the start. Checking on well-recognized usability guidelines (“heuristics”) during the design process will actually reduce costs for development and user testing. Early user interface evaluation during the design process may start without users using “cognitive walkthrough” and “heuristic analysis”. Such testing without users is capable of finding design flaws that are commonly user interface specific. Alternate testing — switching between testing without users and testing with users. Inbetween the design flaws will be removed iteratively. The subsequent testing with users will then reveal more domain specific usability problems. Therefore a combination of both methods is preferable, since each method inherently focuses on a slightly different set of possible usability problems. A higher number of testers will improve the quality of the results, but the marginal benefit is decreasing. In general it is sufficient and economic to have five (5) representative test users during the design process. Run many small tests and revise the design between each test. This is better than running more expensive studies with more users after the design is completed. Selecting representative test users is a crucial task. Unfortunately many companies have problems with organizing a quick, small usability test, when they need the data. The testing is deferred to a later stage, when it already has become more expensive to fix a design flaw. Contact us now for getting started quickly or continue reading about usability and SEO.